Join the fight to help combat childhood illnesses through the art of dance. The CanesTHON University of Miami Dance Marathon will be held from 4 p.m. to 8 p.m. Friday, Feb. 1 at the Shalala Ballroom. 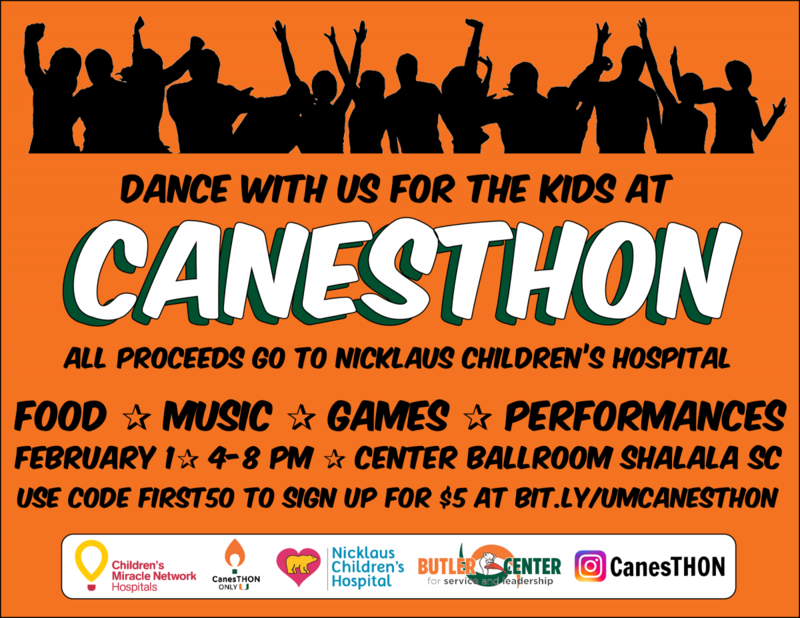 CanesTHON is a fundraiser where the UM community can dance the night away to raise money for the Children’s Miracle Network Hospital, a non-profit organization that helps connect children with illnesses to the life-saving medical care that they need. The Dance Marathon is also a nationwide event that began at Indiana University in 1991. For this year’s CanesTHON fundraising event, Shirley Gelman, a sophomore majoring in business, serves as president and Micah Council, a sophomore majoring in sociology, mathematical statistics and probability is the vice president. Planning the event was important to Gelman because she felt that everyone should do their part to give back to their community and help others who need it most. “I think it is very important to give back to Children’s Miracle Network Hospital especially since our local CMN Hospital is less than three miles from campus. We have a direct and powerful impact on our local community,” Gelman said. CanesTHON will also provide free t-shirts and food, games, inflatables, dancing, and more. To attend, the UM community can register at the event and make a $5 payment.